If you haven't made plans for the zombie apocalypse, now might be a good time. Alternatively, you could play this undead-themed slot from NetEnt and use your winnings to buy yourself a fortified castle on the coast. 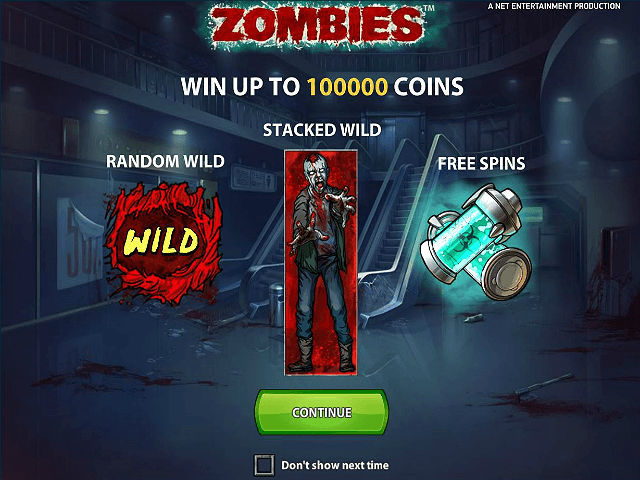 Inspired by the blood-curdling (and sometimes campy) zombie films of the 1970s and 80s, this rather gruesome-looking slot has some decent features. There are 20 possible paylines for you to potentially stack up cash with – as long as you don’t mind brains. Read through this guide to get an idea of what a night with the living dead might have in store. Play Zombies for Real Money! 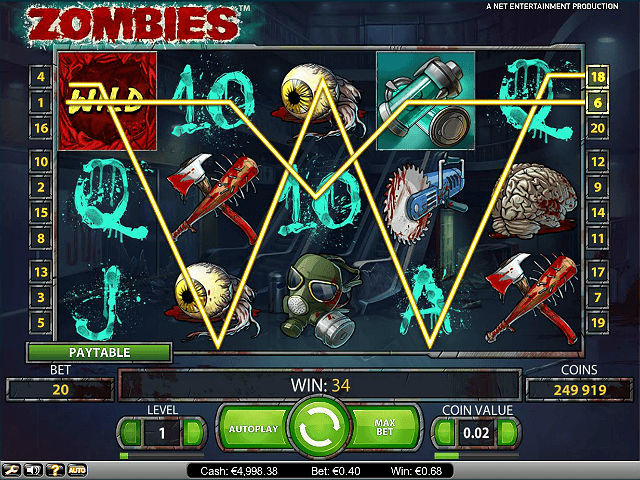 Although it's a few years old now (originally released in 2012),the Zombies online slot still looks pretty good. The backdrop of a now undead-infested shopping mall is no doubt a nod to George A Romero's classic 'Day of the Dead', and the symbols are a collection of blood-soaked axes, baseball bats, and of course, brains. Zombies love brains. There are even some eerie sounds as you load the game up, which set the scene nicely. The interface itself is very bright so impossible to miss as you spin – pretty handy when you need a quick glance to check your level. This slot features five reels with a total of 20 paylines. You can place a stake of anything from 0.01 coins to 0.50 coins, so it's a great online slot for a few quick spins if you don't want anything too serious. There are two bonus rounds though, which can quickly up your winnings. More on these in a moment. The standard low-value symbols are represented by the letters and numbers, so nothing unfamiliar here. Look out for the chainsaw, which is the highest value standard symbol. Get five on a payline, and you can get 50x your initial stake. And hack through zombie hordes, obviously. In addition to the random wild that can appear on your spins, there's also the scatter (represented by a virus-filled container). If you get three of these on reels two, three and four, you get five free spins. 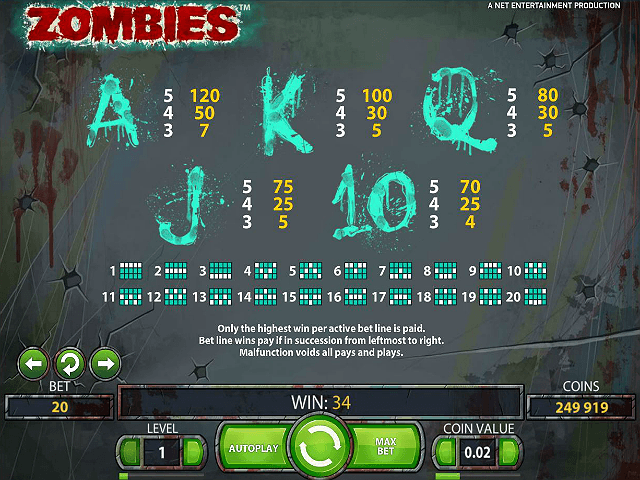 This also kicks off the bonus round, where zombies get blasted to earn you more winnings. The free spins also have a potentially lucrative multiplier as well. It increases per spin, from 1x right up to a 10x multiplier. This can net you a massive jackpot if you're lucky. Possibly even enough for that coastal fortress. There's also a stacked wild feature. This is good for increasing your overall chances. The random wild, while a bit more, well, random, can also give you a boost in the earnings department. The random wild causes two zombie heads to appear on the reels. These zombies then get shot up to six times, with the potential for wilds to appear after each shot. 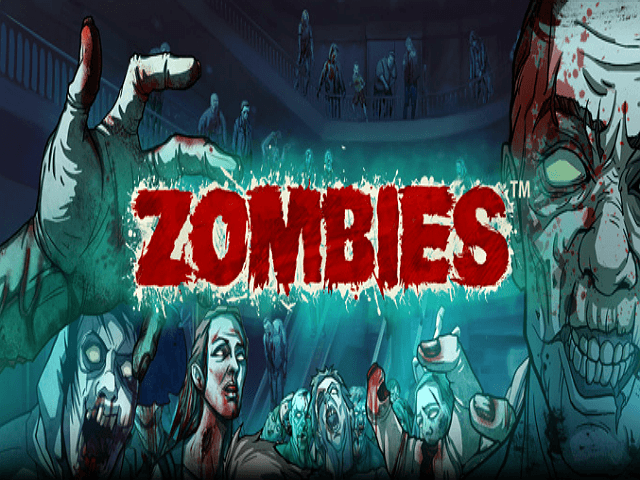 Overall, the Zombies slot is a fairly fun game with some good bonus features. Share this Zombies Review today! 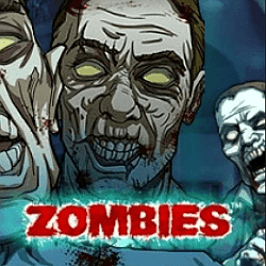 If you like Zombies, you'll love these slot titles too!